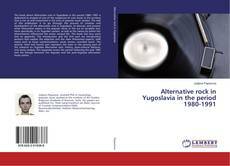 The book about Alternative rock in Yugoslavia in the period 1980−1991 is dedicated to analysis of one of the subgenres of rock music at the territory that is not so well researched in the area of popular music studies. The task of this publication is to go through the process of creation and development of the alternative rock in Yugoslavia, to discover and present what 'alternative' means in the popular music in the era of socialism and, more specifically, in its 'Yugoslav' variant, as well as the means by which the phenomenon influenced the entire musical life. The book has four parts and an appendix. The introduction and the first part are introductory sections that explain the objective and the main theoretical aspects, with topics such as music communications, music scenes, recorded music. The second, third and fourth part represent the main or the priority part of the research on Yugoslav alternative rock: history, socio-cultural features, and music analysis. The appendix covers the period following the year 1991 and the linkage between the Yugoslav and the post-Yugoslav alternative music scenes.